The molds and mildews infestation at home must be dealt with as early as possible, and even better if it is prevented from infesting. If molds and mildews infest inside your home, it can quickly destroy the walls and shorten the longevity of any material it contaminates on its way. And if you are wondering about how to prevent molds and mildews, then let me tell you that there are ways to prevents it from infesting your home. Today I will be sharing with you some important tips on how to prevent mold and mildew infestation at home. This is a very common and general concern, so I hope my today’s article will be of great help to you in preventing molds and mildews. Building a home with your own hard-earned money is nothing less than a treasure, but keeping it properly maintained is certainly a much harder task. You have to take care of every corner of your home and ensure that there is no damage. And in case you see any damage, you will have to immediately get it repaired, or else damage may intensify. But, besides the normal damages that may occur in your home with time or by any natural calamity, there are pathogens which can damage your home to a great extent. Well, by pathogens, I mean the molds and the mildews which are nothing but fungi which are very common in damp humid places. Molds and mildews serve an important purpose in the natural environment by aiding in the destruction of the organic materials like leaves which in turn leads to the enrichment of the soil. The molds and mildews infestation can lead to several health complications as well, more so, in aged adults and infants like for examples, respiratory troubles, sinus congestion, severe heads, infections in throat, eyes, nose etc. In fact, the molds and mildews infect the whole atmosphere in your home and increase the risk of occurrence of several health issues and complications. Molds and mildews are very common during the rainy season thanks to the damp humid weather which favors its growth. It is also much common in old buildings so if your home is a little older, you must be a little extra careful with molds and mildews infestation. It is mainly the moisture content and the humidity in the interior of your home that you need to control. Well, it might sound a little complicated but the measures are really very simple. Keeping your interior space dry and airy must be your ultimate goal to prevent molds and mildews. Apart from ensuring that the interior part of your home is dry and airy, there are many other ways to prevent molds and mildews. And I am happy to share these essential tips on how to prevent mold and mildew infestation at home in today’s post. I am sure, if you apply these tips, then it will help you eradicate molds and mildews from your home easily. The problem of the molds and mildews will not go on its own unless you intervene and solve the problem. So let us learn about some of the easy tricks on how to prevent mold and mildew infestation at home without further delay. The growth of these fungi can occur literally in any damp space of your home starting from wooden surfaces, ceiling tiles, carpets, cardboards, wallpapers, fabric, plants, foods etc. They can develop within 1-2 days and can produce the spores which can travel through the air if given the proper conditions. So, whatever action you have to take, it has to be immediate. Listed below are the top 9 important tips on how to prevent mold and mildew at your home. 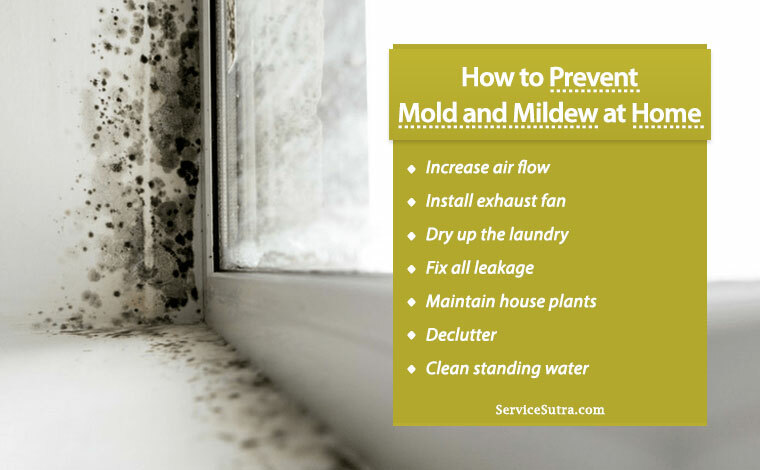 Take a careful note on each of these tricks and implement it at your to prevent molds and mildews. The first thing that you should do is to ensure proper air circulation within your home. Dark and enclosed places contain more moisture and humidity and so it becomes favorable for the molds to grow. But, if your rooms are airy with enough of natural air and sunlight coming in, then you will be able to prevent mold and mildew infestation at your home. So, ensure that all of your rooms have proper ventilation because that will enable proper air circulation inside your home. Also, to ensure proper air flow and to allow natural sun light in your home, you should make it a habit to open the doors and windows at least once every day. Bathroom is one such space in your home which is used maximum and hence it is wet almost all time. This moisture content inside it is just apt for the molds and the mildews to grow. So, it is essentially important to keep the bathrooms dry as much as possible. While ventilation in the bathroom is the basic thing that must be done, having an exhaust fan there will serve much of your purpose. Switch it on every time you use it and keep it on for some time even after that. The exhaust fans will also enable removal of stink from your bathroom if any and obviously it will help prevent mold and mildew infestation. One of the other tips on how to prevent mold and mildew infestation is by not keeping your laundry wet for long. Molds grow within 1-2 days if given the favorable conditions. So if you keep your towel wet or your top wet for long, you will already start getting a nasty smell which is nothing but the mold itself. So, please dry up your laundry immediately after washing them. However, one thing that you have to also remember is to avoid drying your clothes inside your home in case you do not have a drier. This is because the water that will evaporate from the wet clothes will hang in the air inside the home which will in turn; increase the chances of molds and mildews on the walls, floors or other surfaces. So, please dry your clothes outside. But, in case you do not have such option of drying clothes outside, then make sure the room where you keep them is properly ventilated, air circulated and the moisture inside the room is driven out with the help of fans. Leakages occur when the pipes get disintegrated. So, you must keep an eye on this and replace any old pipe which has already started showing signs of getting dilapidated. This is seriously important because a leaky pipe travels much more than the visible signs and without your knowledge even, molds will grow in some corner of your home. And, the problem is, once it starts to grow, it will slowly spread to the other nearby portions as well and may even go out of hand if you have noticed it too late. So, it is always better to stop the problem from the very beginning. Well, I know that no one feels like going down into the musty basement but in order to prevent mold and mildew infestation at your home, you have to take the responsibility to do that. You have to anyway stop the moisture getting trapped beneath your home whether by using a dehumidifier or by installing a foundation drain or by trying to get some more air circulation done. Installing storm or thermal pane windows and insulating the walls helps keep the walls warm and also limits condensation, so you may try some of these ways. Well, having plants at your home is very useful as they keep the air within and surrounding your home clean. But unfortunately, they may harbor your foes, mold and mildew even. Molds love to grow in the soils and leaves of many household plants. So, you have to have a careful eye on it and make sure that the molds do not grow on your plants. Taheboo tea prevents the growth of molds in the soil of the plants, so you can just add this tea in mild solution to your house plant water. This trick is enough to retard the molds growth on house plants. Decluttering your home is one easy tip that I would like to give you on how to prevent mold and mildew infestation at your home. The reason is that the clutter blocks the flow of air and does not let your HVAC system from circulating the air properly. The draperies or the other furniture which blocks the supply grilles leads to condensation. These lead to lot of accumulation of moisture which creates microclimates inside your homes that in turn welcomes and feeds the growth of the molds. So, please dump the unnecessary stuffs from your rooms. Push the furniture far away from the grills and vents and let the air circulate properly. And, on days which are humid, switch on the fans to let the air move. By this I meant that you must use an AC unit which is properly sized for your home. This is because if your AC unit is small, then it will run constantly increasing your electricity bill but not the temperature. On the other hand, if the unit is too big for your home, then it will continuously start and stop which will eventually lead to a lot of wastage of energy. So, use an AC which is perfect for your home which will keep the temperature dry and soothing and will not let the molds and mildews grow. Also, do not forget to evaluate your AC time to time. In case you find the humidity is 60% or more, then you have to check whether you AC is working properly. Inspect the condensate drain pipe of your AC and see whether it is dripping regularly. In case it does not, then the pipe may be blocked which may lead to the accumulation of the water inside the AC unit or on the floor of the room. If there is any such problem, then you must not wait much and call a professional to get it sorted right away as this problem if kept for long may lead to the growth of mold and mildew any time. Sometimes standing water or chronic dampness increases the moisture and humidity in the interior of your home favoring mold and mildew growth. So, you have to be very much alert regarding it. Check out for dampness or puddles around hot water tanks, freezers, basement doors, sump pumps, refrigerators, windows etc. Also, properly do inspection of the crawl spaces for any foundation leaks or ground water dampness. Molds and mildews are not at all welcomed inside or around your home as their growth is harmful for the longevity of your home as well as they infect the indoor air a lot causing lot of health complications. So, it is better that you remain a little cautious and do not allow them to grow. For that, you will have to control the moisture and the humidity inside your home which increases all the more during the rainy season. But, thankfully there are many easy hacks to prevent pests like mold and mildew infestation at home, 9 most efficient of which I have already talked about in my today’s article. Basically, it is your home and you along with other family members have to take the responsibility to check the condition of your home time to time like for example, whether if there is any water leakage or if the AC is not functioning properly or if your home is too much overstuffed which is blocking the airflow etc. These minor problems along with few others favors the growth of the fungi at home and you must be careful about it. I already told you that if the temperature conditions are favorable, these fungi can grow in just 1-2 days as well and once they start growing, it will not take much time for them to spread, so whatever you have to do, you have to do immediately. It is really very essential to protect yourself, your family members and your home before it is too late. Last but not the least, if you fail to get rid of molds and mildews then maybe it’s time to call a professional pest exterminator to help you get rid of this. the local pest control companies can quickly eradicate all types of pests and bugs including Molds and mildews. The tips on how to prevent mold and mildew infestation at your home are very efficient and they are the basic things that one must do. So, I sincerely believe that if you are a bit aware and follow these steps diligently, your home will be free from the molds and mildews.